STILLWATER, USA – When the sun is sizzling and the drinks are ice-cold, it’s time to get on board with KICKER’s® made-for-marine subwoofer so festivities can take place all summer long. With 10 inches of crushing bass, the KM10 Marine Subwoofer brings an entirely new meaning to the term “party barge,” and now in both white or charcoal colors. Rocking from the installer’s choice of either a sealed or vented box, the KM10 sub adds deep, rumbling bass to an existing sound system, while sustaining in the extremely rugged, outdoor climate. 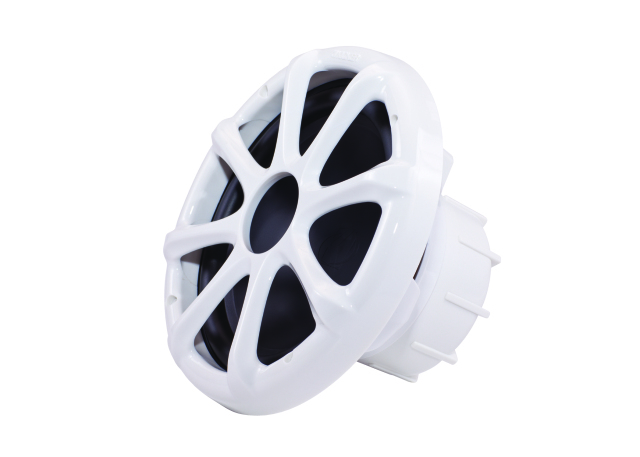 Its sealed motor and cone are completely weather-proof, while the water-tight terminal cover provides strain relief, insulation, corrosion prevention and ignition protection. Additionally, the KM10 subwoofer is engineered with the highest level of magnetic shielding available, minimizing compass and gauge deviation in the boat’s dash and preventing navigational complications. To keep up with the latest standards, KICKER is a member of the American Boat & Yacht Council (ABYC), a leader in education for the marine industry, and the National Marine Manufacturers Association (NMMA), which supports the U.S. recreational boating industry.